In the final days of the Vietnam War, a military organisation and some scientists jet off to an uncharted territory that is unknown to the rest of the world. In their search for civilisation, they find an island covered and ruled by monsters, none bigger than oversized ape and king, Kong. The last time we saw the iconic, colossal ape was in Peter Jackson's 'King Kong' in 2005. That film was very successful, both financially and critically, even winning 3 Academy Awards. However, 'Kong: Skull Island' looks to take a different approach, looking to make the film a complete action movie. The 'beauty that killed the beast' story is swapped for more larger than life creatures. In a period where reboots are criticised for offering very little new content to the series, 'Kong: Skull Island' does look to do something fairly new with the character. With eyes looking towards a new 'MonsterVerse', 'Kong' brings something new to the table, bringing new creatures alongside it. Unfortunately, other than good action, there isn't much to rave about this version of 'Kong'. 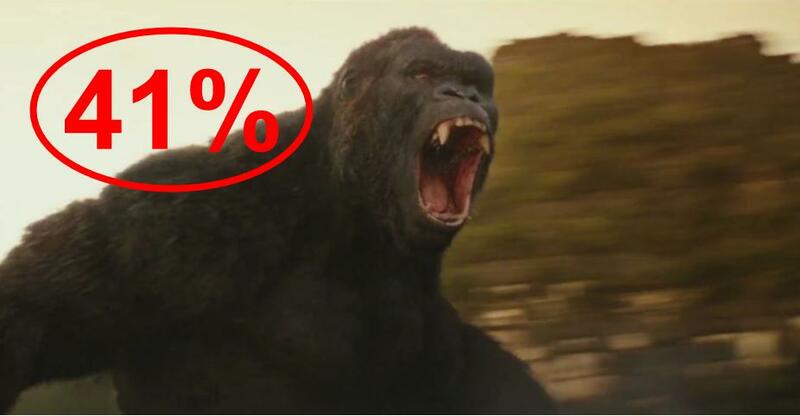 In essence, 'Kong' very much is a blockbuster that you would really expect to see during the summertime, with huge creatures and explosions dominating the screen. This, of course, leads to the film being predominantly action based, featuring CGI monsters battling it out. The 2005 'King Kong' was highly praised for its special effects and that praise can be carried on into this movie. Not only does the main character Kong look incredible but so do the other creatures in the film. Now, it is expected for the creatures to look great in a high budget film like this, but it is still incredible to see lifelike creatures. As someone who's favourite film features large creatures, I'm a sucker for seeing an epic brawl between two behemoths and 'Kong' definitely delivers that. Due to this, the two-hour runtime does go past quickly as you can really sit back and just enjoy the spectacle. That only really goes for the action, however, as the quality of the rest of the film really lets it down. 'Kong: Skull Island' is ultimately undone by a very, very weak script. The script looks to balance brutal and hard hitting action with an abundance of humour. The dialogue feels incredibly out of place as the tones clash to make something fairly terrible. You will be rolling your eyes as jokes are seemingly forced in to try and make the film funny. There's no reason for this to be the case. This film should've been tension filled and even scary as these people look to stay alive on an island where everything wants to kill them. In fact, this even detriment the action aspect as something brutal will be about to or happen and then you get some cheesy joke. When you're showing the brutality of these creatures, you do not need the characters making a mockery of it. The humour is so out of place at times and it simply isn't funny. In fact, the funniest parts of the film are unintentional. What helps make 'Kong' more enjoyable is the amount of absurdity within the film that you cannot help but laugh at. To some, these may be too hard to bear and will simply hate it. For me, I couldn't help but laugh at these moments which did actually bring enjoyment to the film, not necessarily in the best way. When you're trying to make an emotional death, you can't have a character be picked off in a brutal and ridiculous way. When you create a rule within an area or scenario, you have to maintain it. There are so many ridiculous moments in this film that are baffling. It really makes you question the studio's decision making as you can't imagine how some of these moments snuck into the final cut of the film. Again, these moments show just how much of a mess was made with the tone in this film which ultimately is its downfall. When you look at the cast of this film on paper, you have an incredible ensemble on your hands. You have recent Oscar winner Brie Larson, Marvel fan favourite Tom Hiddleston, the always incredible John Goodman and highest grossing actor ever in Samuel L Jackson all starring in this movie. After seeing such an impressive cast, you'd be very disappointed to know that the film does not use any of them to their full potential. You could've used any actors in these roles as there was simply nothing to the characters. They are very one dimensional and you aren't given a lot of time to really relate, care or even like most of the characters. Any sort of development is completely rushed, especially the minuscule relationship between Larson's Weaver and Kong himself. It seemed as if they wanted to try to create a bond between the two but it was very half-hearted, only using two scenes to try to make it impactful. You're probably thinking, why would you go see a film like this if you are looking for strong, deep characters? Well, the film tries to make many emotional moments that pander to the audience to try and be more than just a dumb action film. Also, if the film is about those people trying to survive on this island, should you not want to root for them? Should you not want a reason for them to survive other than it's just a certain actor? The cast could have been utilised so much better, even if this was just another action film. I'd be lying if I said that the latest Kong film wasn't entertaining. Sometimes this was due to some great fights and moments of action - despite some Michael Bay-esque slow-motion scenes. However, a lot of the enjoyment comes from this being one of the most ridiculous films with unintentionally funny moments. A better script and utilisation of characters could've seen this become a great monster movie. Unfortunately, these aspects caused more damage than Kong ever could. So have you seen 'Kong: Skull Island'? If so, what did you think of the film? I hope that this review was useful for if you were planning on seeing the film or not! Once again, thank you for taking the time to read my review, it is much appreciated!